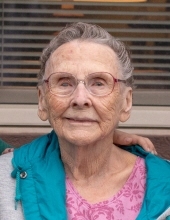 BANKS-GOCHA - Bettie Jo - Age 92, A 30 year resident of Shiawassee Shores in Linden, died March 22, 2019. Funeral services will be held 12 PM Saturday, March 30, 2019 at Linden Free Methodist Church, 13274 Linden Rd., Linden. Pastor Jim Thompson and Pastor Bill Moull will officiate. Burial will follow in Fairview Cemetery. Visitation will be held from 10 AM until the time of service Saturday at the church. Bettie was born October 1, 1926 in Jefferson City, MO, the daughter of Lawnie and Stella (Patterson) Hitt. She is survived by her son, Paul and wife Vickie Banks; grandson, Benjamin and wife Monica (Munson) Banks; great-grandchildren, Isabel and Aidan; several nieces, nephews and the many members of the Gocha family. She was preceded in death by her parents; husband, William Banks; her second husband, Donald Gocha; sister, Vivian Soldan; brother, Lawnie Hitt Jr.
To send flowers or a remembrance gift to the family of Bettie Jo Banks-Gocha, please visit our Tribute Store. "Email Address" would like to share the life celebration of Bettie Jo Banks-Gocha. Click on the "link" to go to share a favorite memory or leave a condolence message for the family.